You Have The Chance To Win a $10,000 App Store Gift Card From Apple! For those who regularly read my blog posts, you already know that Apple is one of my “Love marks” and here is a post about their latest “promotion”. Since its creation, Apple’s App store users downloaded more than 24.9 billion apps and now that it’s going to hit 25 billion downloads, Apple decided to give away a $10,000 App Store gift card. • You need to have the minimum age required by law in the country you are in at entry time. • Any employee of Apple Inc. and their immediate family (spouse, parents, siblings and children) are not eligible. 1- By downloading an app from the App Store. 2- By filling a non-purchase online entry available on Apple’s website. 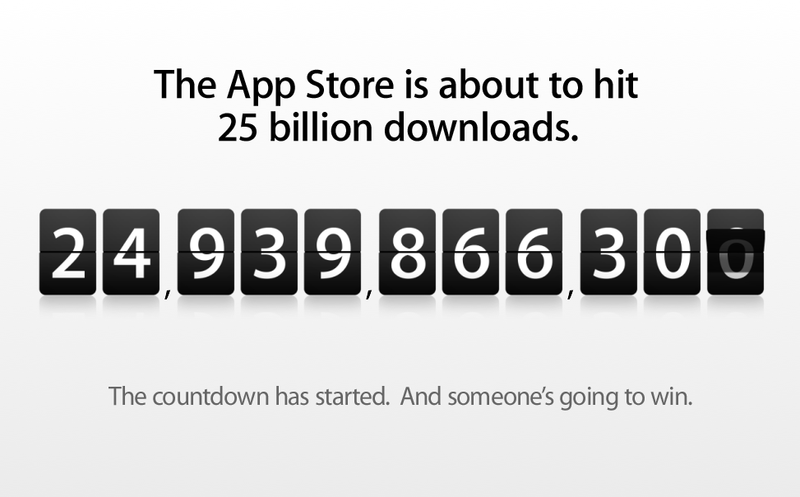 The first person who will download an app OR submit a non-purchase online entry right after the download of the 24,999,999,999th app and you can check the counter on Apple’s Website. There are some other rules concerning the use of any automated software and some other stuff too. Check them out on the official rules page published by Apple Inc.
How is this good for Apple? This promotion is great for the company because it encourages users to download more and more apps to get closer to the 25 billionth download and also it raise awareness about how successful is Apple’s App Store. Unconsciously, a lot of people will position the store on a higher level in their mind comparing to other app stores and that is crucial for Apple to face the rise of competition. Don’t forget that the app store is also a great source of revenue for Apple. Moreover, allowing people, who are not necessarily users of Apple products, to participate through the non-purchase online entry is a way of attracting them.